Sailors coached by Victor Kovalenko have won ten medals in eight Olympic Games, six of them gold. 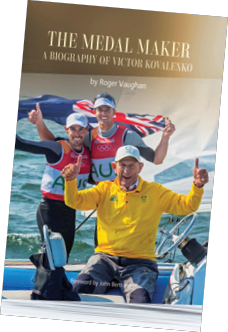 As John Bertrand (who skippered Australia II to victory in a certain regatta in the waters off Newport, RI in 1983) observes in the Foreword, Kovalenko is the most successful Olympic sailing coach the world has ever seen. Born in 1950 and raised in Ukraine under USSR rule, Victor Kovalenko became a national champion in the Flying Dutchman. He obtained a university degree in Sports, and became a coach, winning his first medal with a Ukrainian Women’s 470 team. After the 1996 Olympic Games, Victor was recruited by Australia. With political problems a deterrent in Ukraine, he accepted. Victor’s teams have won 10 medals (six gold) in eight Olympic Games, a coaching record. 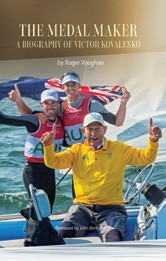 He is Australia’s head (and Men’s 470) coach. He is currently preparing his teams for the 2020 Games in Toyko.